For your puppy to grow into a healthy, balanced dog, you must demonstrate leadership from day one. 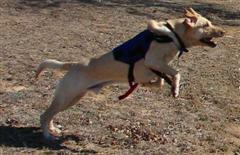 The sooner you set rules, boundaries and limitations, the sooner you get to enjoy a healthy, happy, and balanced dog. We’ve learned in other lessons that dogs follow calm-assertive leaders. 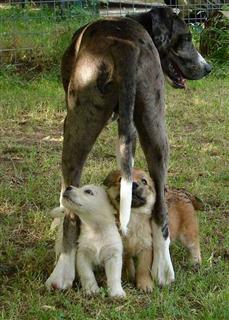 The pack leader, the mother or the male, embodies calm-assertive leadership. Dogs communicate through energy at every moment. The pack leader projects calm-assertive energy, and the rest of the pack responds with calm-submissive energy. This is how the pack achieves balance. From the moment puppies are born, the mom sets rules, boundaries and limitations. She tells her puppies how far they can go away from the den and when to eat, and she walks with them. The mother also allows the puppies to share activities with each other. When she wants play to end or just disagrees with what’s going on, she picks up a puppy and takes him to another spot. In all of these ways, the mom sets rules, boundaries and limitations and, in doing so, nurtures her puppy’s healthy state of mind. As adults, dogs look to their pack leader to set these rules. If you are to understand the animal in the dog, you must forget human psychology when dealing with your canine. Mother Nature created pack dynamics to guide the development and adult lives of dogs. Dogs become unstable when they live with us and lack a calm-assertive pack leader. To achieve this, you must duplicate the action and attitude of a canine pack leader. Set and enforce rules, boundaries and limitations in a calm-assertive and consistent way. Feed your dog after her mind reaches a calm-submissive state and never reward unstable behavior. Walk with her every day like her canine pack leader would. And only share affection after projecting the calm-assertive leadership that Nature has intended your dog to follow. People ask me when they should start setting rules, boundaries and limitations. The answer is now! Most people get a puppy and wait to teach him rules, boundaries or limitations until six months or one year old. Meanwhile, the puppy is teaching you rules, boundaries and limitations. At this point, rehabilitation is required, because you will have to regain the position you lost a long time ago. So start now! The sooner you set rules, boundaries and limitations, the sooner you get to enjoy a healthy, happy, and balanced dog. 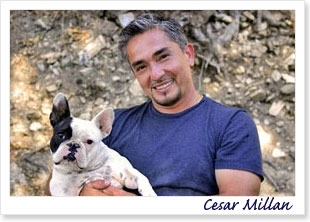 Note: Cesar Millan is a professional. Please consult a qualified trainer before attempting these techniques with your dog. For more information, visit Cesar Millans Dog Psychology Center where the express purpose is to rehabilitate and maintain a dogs natural state of being. The shopping list for a new puppy can be long and expensive: food, grooming tools, crates, bedding, toys, and miscellaneous accessories, which, when added to the expense of veterinary preventive care, can easily top $1,000. But don't panic! Use this checklist to make sure you shop wisely and save money while still having the necessary equipment and supplies on hand. Read the labels. More information here! Watch portion sizes. Quality foods packed with highly digestible nutrients tend to require smaller portions than less digestible foods and in the long run are quite comparable in price; however, you should expect to pay anywhere from 24 cents a day for a small breed puppy to $1.30 a day or more for a large breed puppy. Part of your puppy's routine care will include keeping parasites such as fleas, ticks, and worms at bay. Products are available through your veterinarian and as over-the-counter treatments. Buckle up. A buckle collar made of nylon or cotton webbing ($7 to $15) is safe, can be cleaned, and wears well, says animal behavior specialist Kari Bastyr, MS, owner of Wag&Train dog training (www.wagandtrain.com) in Denver. Fit the collar so that at the tightest hole you can fit two fingers between the collar and your pup's neck so he will have room to grow. Keep it light. Nylon or cotton webbing leashes are also economical choices. To keep your pup comfortable, choose a leash that is light and thin and between four and six feet long ($10 to $15). Non-permanent IDs. ID tags ($4 to $10) are inexpensive and attach to the collar. Permanent IDs. One option is a tattoo ($15, not including anesthesia; often performed during spay/neuter); another is microchipping ($50; does not require anesthesia). Cutting edge IDs. You can purchase a Global Positioning System (GPS) location device for dogs, which fastens securely to the collar, designed by GlobalPetFinder ($350 per unit, $35 activation fee, $18 to $20 per month subscription fee). Entertainment value. One of the newest trends in toys is the interactive toy, designed to involve the puppy in play. For example, toys that make unusual sounds when moved, treat-dispensing toys, and automated systems that randomly release toys throughout the day. Know your chewer. Some puppies can be left safely to play with strong, durable toys; others will find a way to shred and choke on just about anything you might give them. Be particularly aware of the size of the toy; your puppy can swallow balls larger than his jaws. Also be aware of the materials it is made from - latex tears, stuffing can be swallowed, and bones can splinter). Always supervise your pup's chewing. Crates and gates are an essential part of housetraining and though they can add up to more than a couple hundred dollars, being able to partition your home and provide a safe training environment for your puppy could be priceless. The Perfect Crate. "The idea is to have the crate small enough that the puppy can't potty in one corner and sit in the other," Bastyr says. Because a pup grows so much in size his first year, consider buying a crate that lets you insert a partition, making the crate smaller for the puppy. The most durable crates are made of hard plastic or wire ($25 to $120). Gated community. 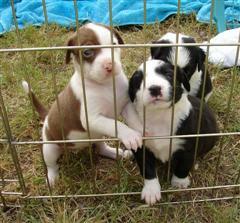 Baby or dog gates ($25 to $80) let you keep your puppy in sight and confined to a specific area. They come in varying heights and widths, are offered in wood, plastic and metal styles, and can be wall-mounted or temporary. To save money, check yard sales and thrift shops for used gates. Bedding on a budget. "No one's made an indestructible puppy bed," laughs Bastyr, who recommends not spending much money on a young pup's bed. "Choose the $15 bed over the $150 one, or just use a clean blanket," she says. "The most important thing with puppies is that they are touched so they are ready to be groomed, have their teeth brushed and their toenails clipped when they are older," Bastyr says. What you'll need. To get your pup used to grooming, purchase a soft bristle or pin brush ($4 to $5), a toenail clipper ($6 to $15), and a finger (tooth) brush ($8 for the brush; $9 for dog toothpaste). It's easy to be overwhelmed by a puppy's material needs. Fortunately, most of these purchases are one time expenses, especially if you keep non-durable items out of reach of your puppy's inquisitive mouth. A good solution to this is a crate. A crate is any container, made of wire mesh or plastic, that will hold the puppy comfortably, with enough room to stand and curl up and sleep, but not too much that it can eliminate in one corner. See the section on housetraining below. Other solutions include fencing off part of the house, say the kitchen or garage or building an outside run. Be sure the area is puppy-proofed. Dog containment will be more important at this point in a puppies life as they become more curious. It may be a good time to begin considering what dog containment options may be right for you. Please put your pup in an environment it can't destroy. Puppies are too immature to handle temptations. Depending on the breed, most dogs begin to gain the maturity to handle short stints with mild temptations when they're about 6 months old. Consider the analogy with a baby, where you keep it in a crib, stroller, or pen if you are not holding it. It is essential to puppy-proof your home. You should think of it in the same way as child-proofing your house but be more thorough about it. Puppies are smaller and more active than babies and have sharp teeth and claws. Things of especial concern are electric wires. If you can get through the puppy stages without having your pup get a shock from chewing a wire you are doing a great job! When puppy proofing your home, get down on your hands and knees (or lower if possible) and consider things from this angle. What looks enticing, what is breakable, what is sharp, etc. The most important things are watching the puppy and, of course, crating it or otherwise restraining it when you can't watch it. Another step in puppy proofing is house proofing the puppy. Teach it what is and isn't chewable. The single most effective way to do this is by having a ready supply of chewable items on hand. When the puppy starts to chew on an unacceptable item (be it a chair, rug, or human hand), remove the item from the puppy's mouth with a stern, "NO!" and replace it with a chew toy and praise the puppy for playing with the toy. If you are consistent about this, the puppy will get the idea that only the things you give it are to be chewed on! Don't stint on the praise, and keep the "No!" to a single calm, sharp noise -- don't yell or scream the word.